Imagine waking up every morning in the country; sunlight filling up your bedroom along with the joyous singing of the birds. A sturdy wooden bed inviting to stay longer and enjoy the moment. There’s an undeniable charm in that. 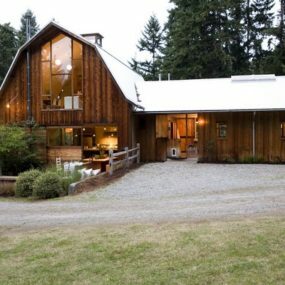 But if living in the country or at least suburbs is not an option in the nearest future rustic style can help you replicate some of that country charm at home. 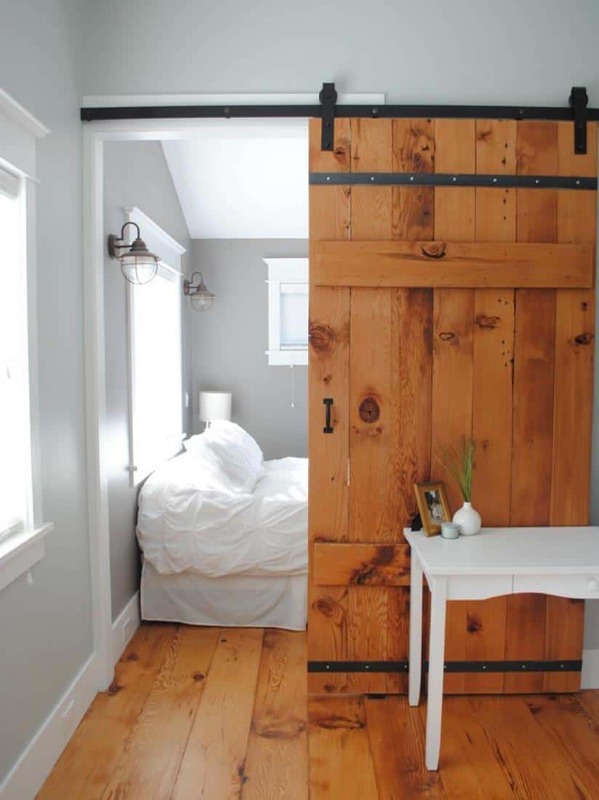 And what can be more country than the barn doors? 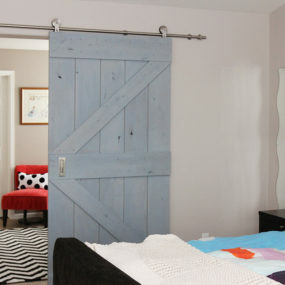 Barn doors are quite versatile and can be used in any type of rooms. 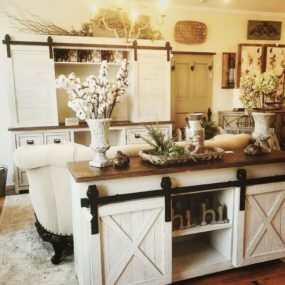 Bedroom, living room, bathroom, and even a dressing room can all benefit from the rustic aesthetic. 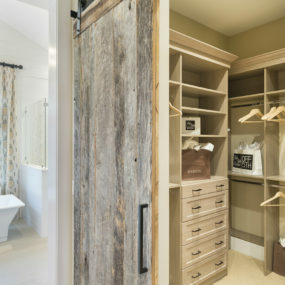 Mixing the modern interior design and a rustic accent in a barn door yields incredible results. 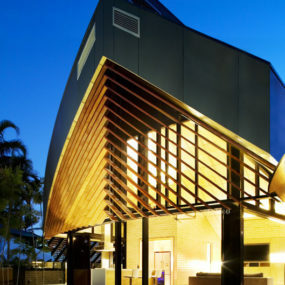 In this beach house in Singapore the home office features a different sliding mechanism that fits the door more snugly into the entrance. 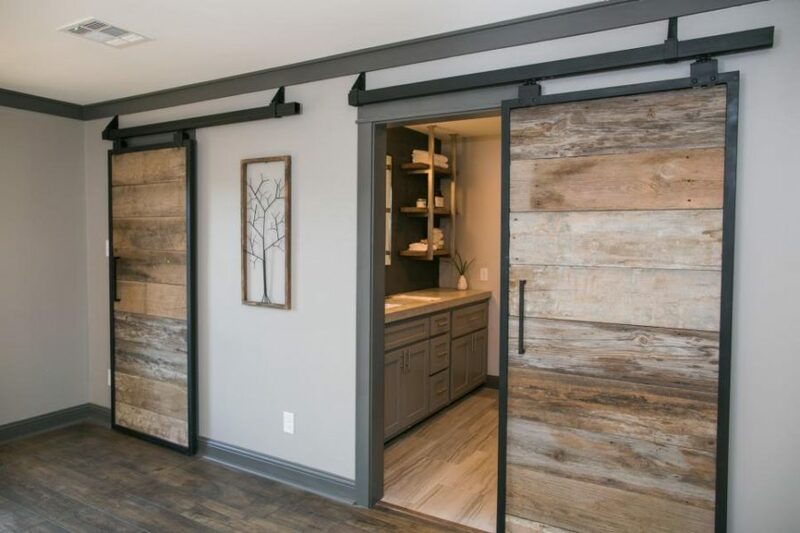 This just may increase the soundproofing of the room but in general there will always be some space between a sliding barn door and a wall, therefore it’s best to use it in the rooms where you want more air flow like bathrooms. 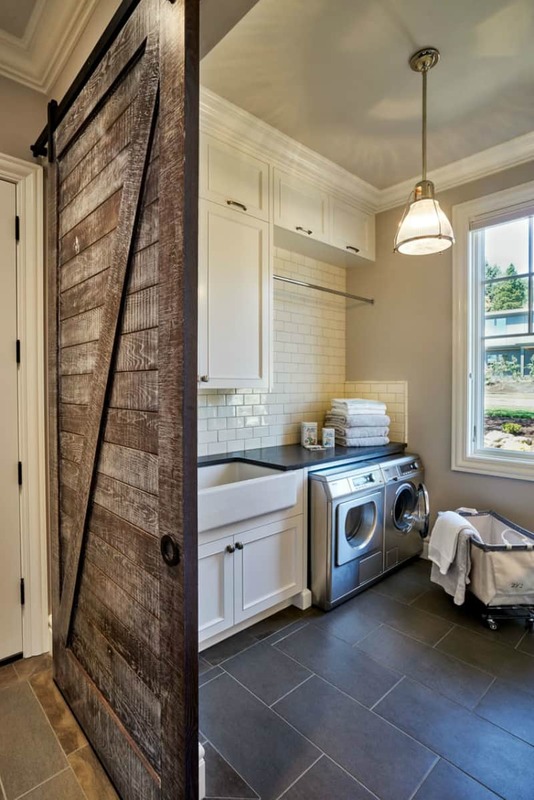 Premises like closets, laundry rooms, and pantries can also make use of the barn doors. They don’t just help to disguise the utility rooms but also bring in the decorative element to their mundane atmosphere. 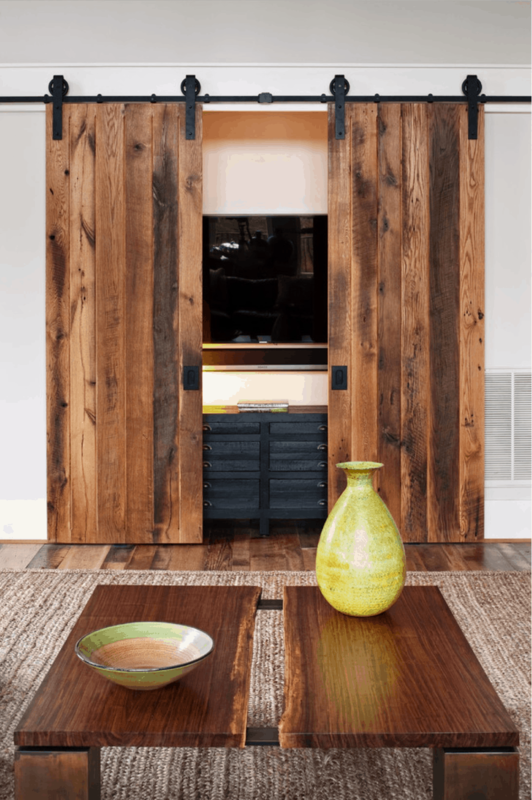 Many utilize the sliding mechanism of the barn doors to create a TV panel that would disguise the electronics that tend to ruin such specific styles as rustic chic. 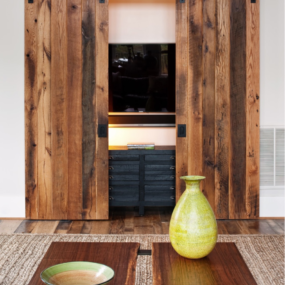 For instance, here the full-sized barn doors are used to hide the alcove with a TV and a cabinet. This not only makes for a cleaner but also a more uniform look. They don’t even have to be real doors. 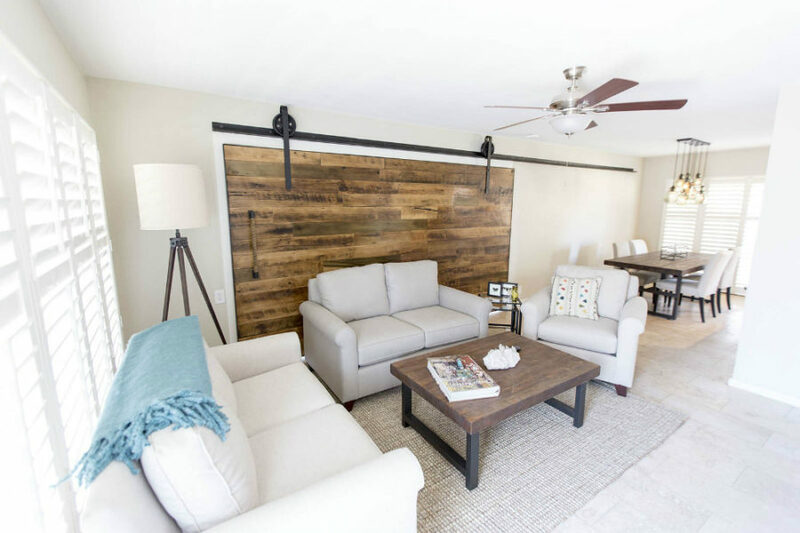 Wooden planks and beautiful pieces of driftwood could work as well. 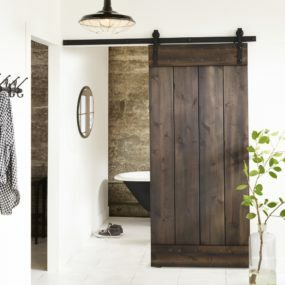 Classic barn doors are made of wood. Natural finish makes for a more traditional look and works best in the interiors where there’s a lot of natural stone and, of course, wood. 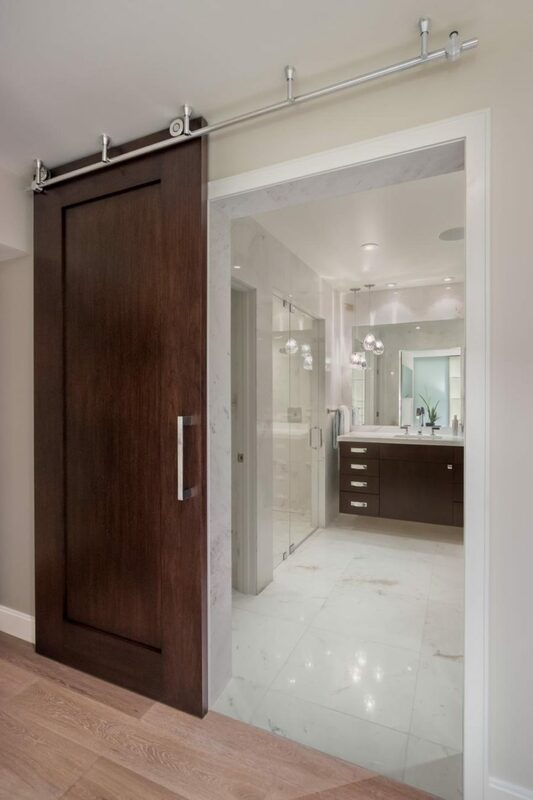 Some modern designs come in more sophisticated sleek finishes though and even feature modern handles that give them a dressier look. 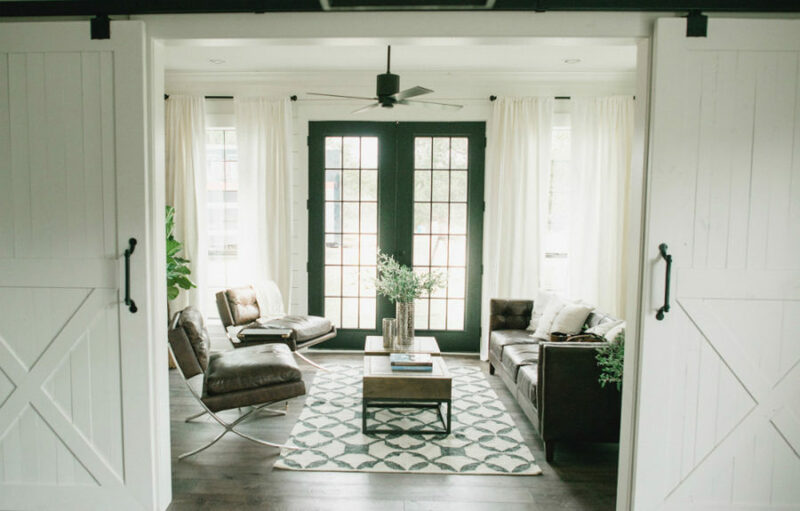 You can choose the aesthetic that speaks to you the most and it doesn’t have to be necessarily rustic. Even wooden barn doors can differ in style. Some of them will have a fence type of structure while others will look like they came off a real barn. 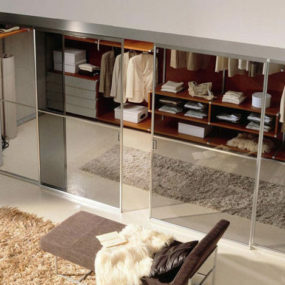 Yet others may feature more wardrobe-like design and give your room a misleading appearance. 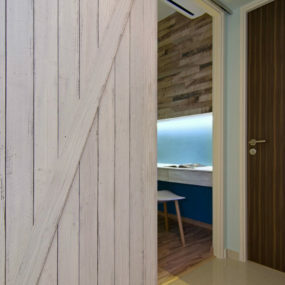 But if you’re after that kind of aesthetic it helps that there is such a rich market for different barn door designs. 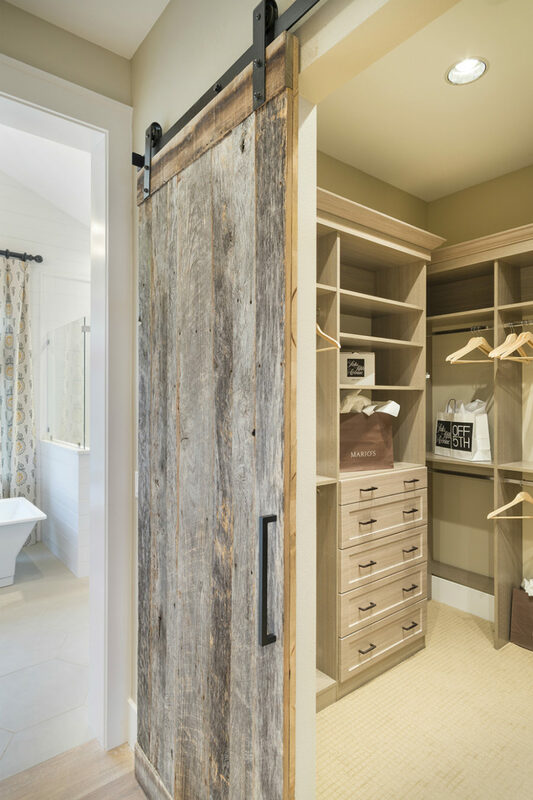 Painted wooden barn doors are probably the most popular since they allow to create a strong accent in both rooms that they’re dividing. They can also be easily repainted come renovation time and touched up whenever necessary. 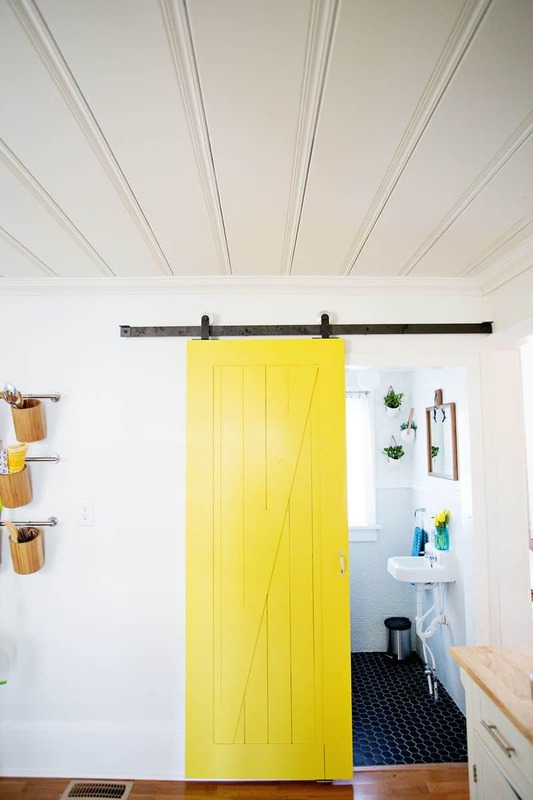 Since paint comes in a limitless number of hues you can really have fun with making a bright accent out of your barn door. And it will look equally amazing in neutral colors. Sargam Griffin though offers something a bit more elaborate than a coat of regular paint. His Armoni artwork is an incredible way to add a unique touch to the interior. Although the doors and hardware aren’t included into the price for the artwork you can be sure you’re getting a unique piece because each edition comes with different custom details and layers of oils. Called ArtDoors the collection comprises just over a dozen of different styles in a wide variety of colors to choose from. 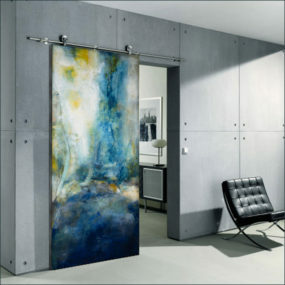 Other barn doors are can be made of metal, glass, and even plastic. They all look differently and definitely lack that country style. 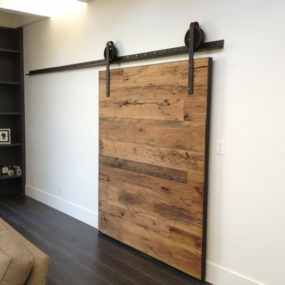 Metal barn doors aren’t that widespread but they can be custom-built out of anything. 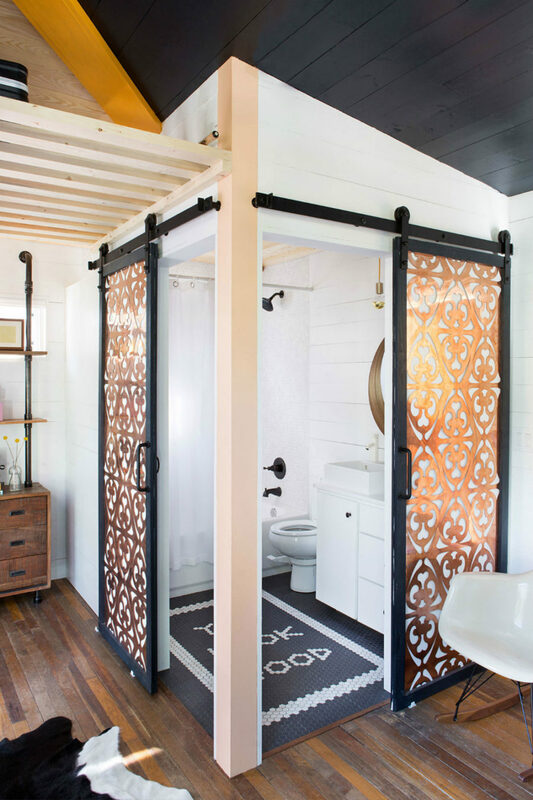 In this house in Austin, TX the designer Kim Lewis used laser-cut copper barn-style sliding doors to give the bathroom a decorative look. Since it stands in the bedroom there was a need for something not only airy but also beautiful. The distressed finish is also quite popular as it brings a very raw aesthetic to the interior. 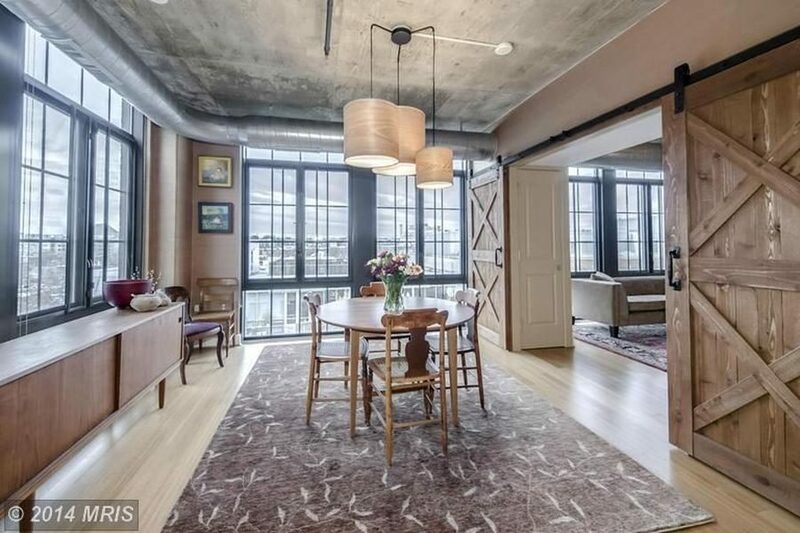 Chipped paint and stripped wood have their own charm and can look really convincing even in a penthouse. 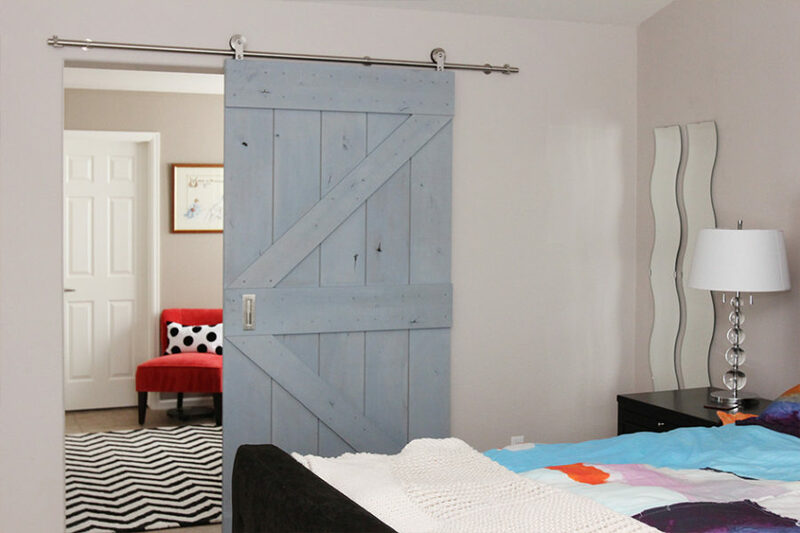 Big-sized barn doors are perfect for separating the areas in the open plan houses. They can even act as retractable walls between the rooms that help regulate the layout according to the residents’ needs. 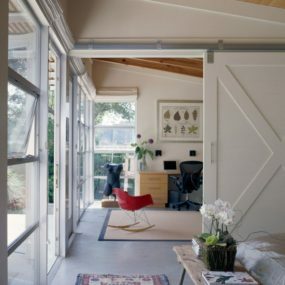 Most of the time a single barn door would suffice to cover the entry but it depends on its width. 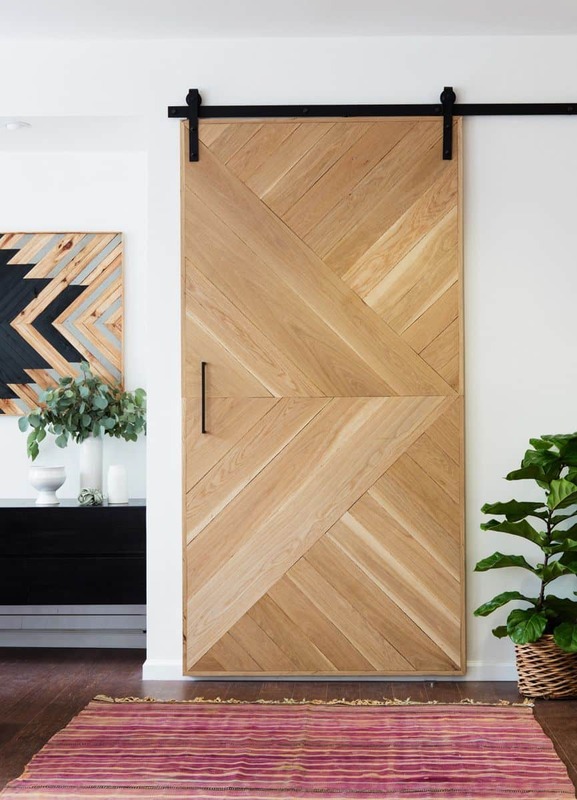 Wider entrances may require either a bigger door or a double barn door. Slimmer doors look great in pairs but also work well for the narrow entrances. 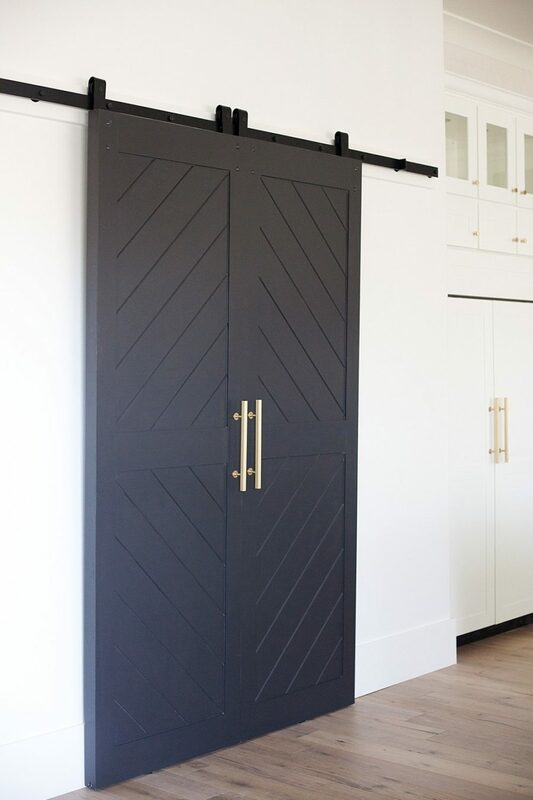 Though double doors somehow do look more dramatic especially if you repurpose old French doors or some vintage ones. 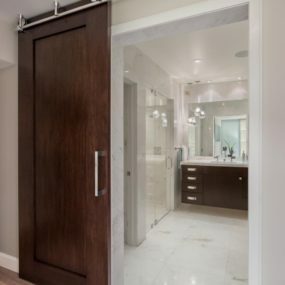 There are truly a lot of options out there and you don’t have to stick with the barn doors in a strict sense. Some of those vintage designs look simply remarkable. 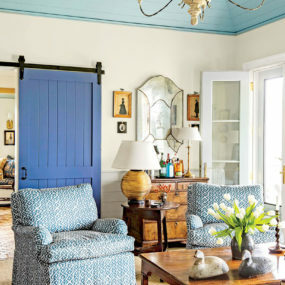 Double doors don’t have to slide towards each other. You can use doors of the same style for different entrances. This may be a bit confusing for the guests but if you like uniformity this just might work. 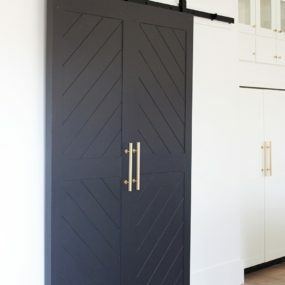 The beauty of barn doors is that they don’t have to match the entrance exactly. 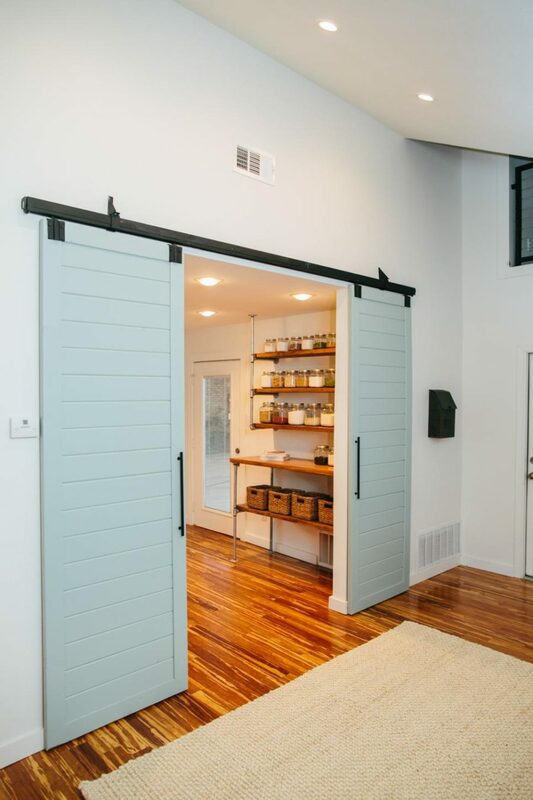 And so even the widest entryways can be cut off without a hassle with a simple sliding barn door of an appropriate size. 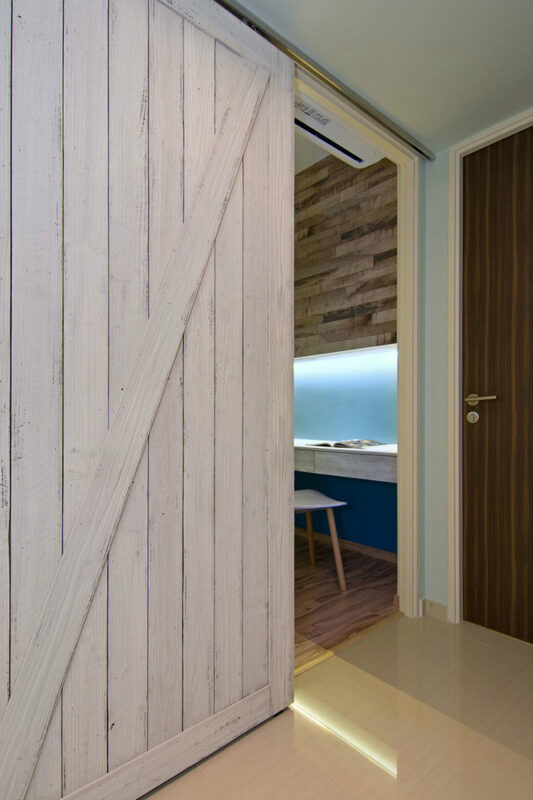 This way you can keep the roomy entrances as well as enjoy some privacy whenever needed. 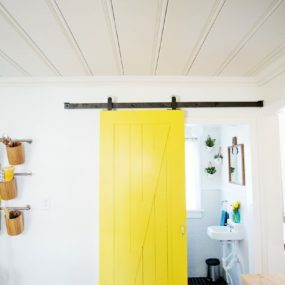 There is a lot of versatility to the barn doors. Covered in a chalkboard paint they can make for a very amusing kid’s toy or a handy addition in the kitchen. 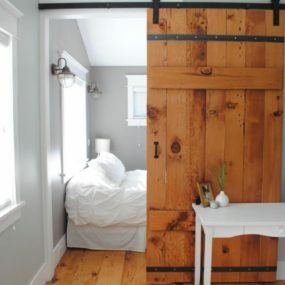 Barn doors can be repurposed, recycled and handmade. But if you are after a finished product these may set you back a few hundred dollars. 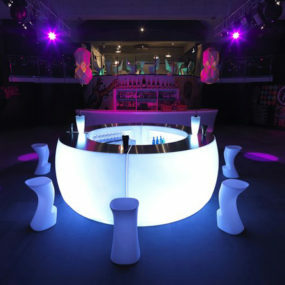 Seeing as they add a lot in terms of the rustic flair and country spirit it seems like they are totally worth the cost.